JULY/AUGUST | PAGE 49 | 2016 BY MATTHEW RAMIREZ. PHOTOGRAPHY AMANDA GRIFFIN. CHATEAU DOMINGUE WELCOMES THE GIANNETTIS FARM TO FABLE Chateau Domingue owner Ruth Gay hosted Brooke and Steve Giannetti of top L.A. design shop Giannetti Home at her architectural antiques Mecca for a discussion and signing of their latest book, Patina Farm (Rizzoli), which details the Giannetti's move to an idyllic farm in Ojai Valley. Decorating devotees snapping up copies: Ginger Barber, Kara Childress with daughter Sloan, Lara Fauntleroy, Mary Catherine Odegard, Becky Birdwell, Karen Roush, Carol Barden, Claudie and Rino Jasper, Claudine Kurp, Margaret Naeve and Brad Parker, Melissa Ison, Nina Wickman, Anne Giles, Tracy Gay, Paul Gay, Lindsay Sturm, Austin Burger, Katie Lemon, Shelby Beeching, Daniela Herring, and Chateau Domingue's Shawnna Fatjo. Anne Giles Ashley Gibson Ansley Wallace Mary Evans McCloskey Brooke Giannetti Steve Giannetti Austin Burger Lindsay Sturm Jill Egan Patrick Egan Melissa Ison Shawnna Fatjo Grace Weatherly Lara Fauntleroy Karen Roush Claudine Kurp Becky Birdwell Sloan Childress Kara Childress Brad Parker Kim White Mary Catherine Odegard Mary Torres Kim Hranicky Paul Gay Claudie Jasper Rino Jasper Ruth Gay Nina Wickman Lori Guglielmini Margaret Naeve "THE UNDERSTANDING OF HOW TO TRANSCRIBE IN PAINTING THIS BEAUTY IS A TECHNICAL AND PHILOSOPHICAL QUEST." IN T alk about a bounty of blossoms: In July, the American debut of one of Europe's most celebrated painters of nature, Claire Basler, literally bursts forth at The Houston Design Center. The month-long viewing, timed for the festivities surrounding Bastille Day, unveils at Alkusari Stone showroom Friday, July 8. How did Basler come to journey to Houston? The story begins in the 1990s, when Houston private gallerist Yvonamor Palix — then based in Paris and showing such cutting-edge talents as performance artist Orlan — had an unlikely encounter. Palix recalls, "I stumbled upon Claire's work over 20 years ago in Paris in a tiny flower shop around the corner from my art gallery in the Bastille. It caught my attention because I have always detested paintings of flowers, but something transformative happened to me. I was instantly taken by the three paintings I saw there." The dealer and artist met shortly thereafter, and a professional relationship and friendship were forged. 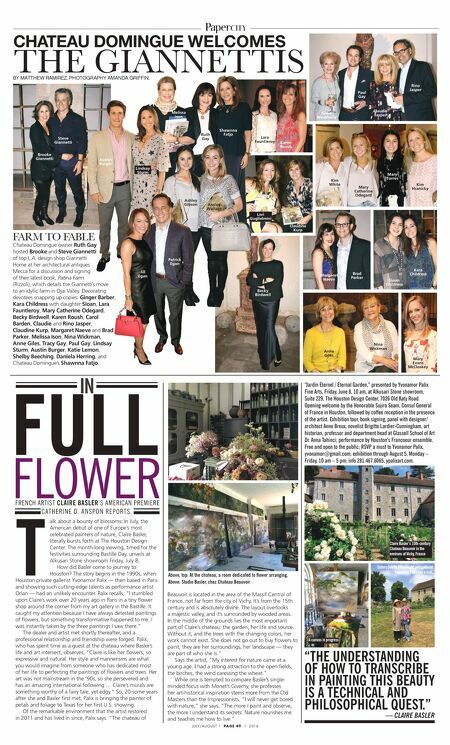 Palix, who has spent time as a guest at the chateau where Basler's life and art intersect, observes, "Claire is like her flowers, so expressive and natural. Her style and mannerisms are what you would imagine from someone who has dedicated most of her life to perfecting the paintings of flowers and trees. Her art was not mainstream in the '90s, so she persevered and has an amazing international following … Claire's murals are something worthy of a fairy tale, yet edgy." So, 20-some years after she and Basler first met, Palix is bringing the painter of petals and foliage to Texas for her first U.S. showing. Of the remarkable environment that the artist restored in 2011 and has lived in since, Palix says. "The chateau of C AT H E R I N E D. A N S P O N R E P O R T S. FRENCH ARTIST CLAIRE BASLER'S AMERICAN PREMIERE Beauvoir is located in the area of the Massif Central of France, not far from the city of Vichy. It's from the 15th century and is absolutely divine. The layout overlooks a majestic valley, and it's surrounded by wooded areas. In the middle of the grounds lies the most important part of Claire's chateau: the garden, her life and source. Without it, and the trees with the changing colors, her work cannot exist. She does not go out to buy flowers to paint; they are her surroundings, her landscape — they are part of who she is." Says the artist, "My interest for nature came at a young age. I had a strong attraction to the open fields, the birches, the wind caressing the wheat." While one is tempted to compare Basler's single- minded focus with Monet's Giverny, she professes her art-historical inspiration stems more from the Old Masters than the Impressionists. "I will never get bored with nature," she says. "The more I paint and observe, the more I understand its secrets. Nature nourishes me and teaches me how to live." "Jardin Éternel / Eternal Garden," presented by Yvonamor Palix Fine Arts, Friday, June 8, 10 am, at Alkusari Stone showroom, Suite 229, The Houston Design Center, 7026 Old Katy Road. Opening welcome by the Honorable Sujiro Seam, Consul General of France in Houston, followed by coffee reception in the presence of the artist. Exhibition tour, book signing, panel with designer/ architect Anne Breux, novelist Brigitte Lardier-Cunningham, art historian, professor and department head at Glassell School of Art Dr. Anna Tahinci; performance by Houston's Francoeur ensemble. Free and open to the public; RSVP a must to Yvonamor Palix, yvonamor@gmail.com; exhibition through August 5, Monday – Friday, 10 am – 5 pm; info 281.467.6065, ypalixart.com. Above, top: At the chateau, a room dedicated to flower arranging. Above: Studio Basler, chez Chateau Beauvoir — CLAIRE BASLER Claire Basler's 15th-century Chateau Beauvoir in the environs of Vichy, France A canvas in progress Sisters Odette Macdonald and gallerist Yvonamor Palix pay a visit.